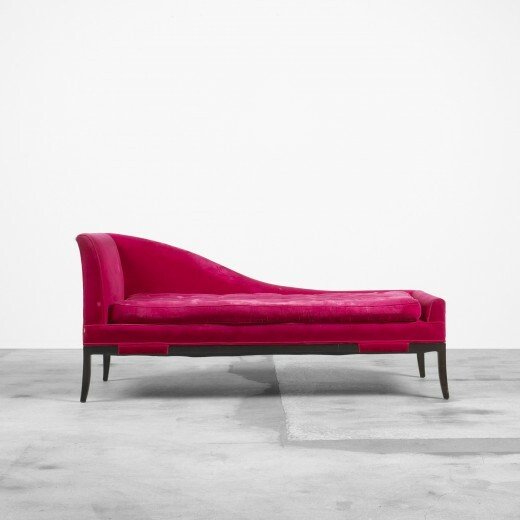 There's something almost decadent about lounging in a chaise longue. They conjure up days of leisure when we had hours to spend reading or doing needlework! Maybe that's what makes them so attractive now - we have very busy lives and we can indulge ourselves just a bit on a chaise. 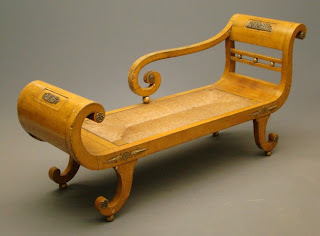 Chaise longues come in old and new shapes. 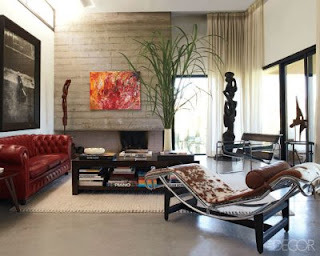 This modern classic is a Le Corbusier design. 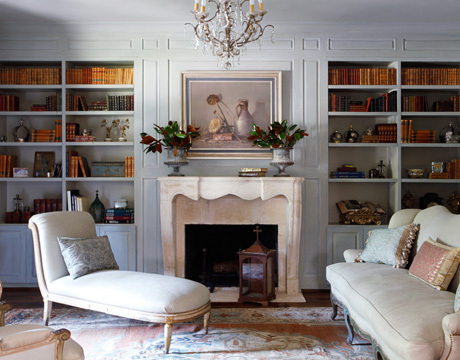 An Empire chaise in this French inspired library just makes you want to lie by the fire for a little relaxing snooze. 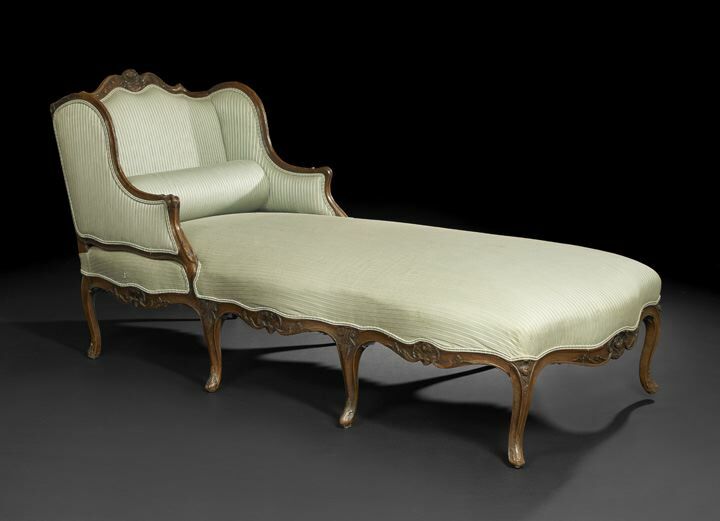 This elegant 19th century New York grain painted daybed is gorgeous! It's a work of art with the sensuous fluted arms and legs, and lovely brass details. This is being offered in a Copake auction January 1st, and their description says that a similar one can be found in the Brooklyn Museum. This has an auction estimate of $2,000 - $2,500. It just needs a beautiful cushion. These delicious modern chaise longues are included in the Wright Modern auction December 14th in Chicago. The one in the photo at the top was designed by T.H. Robsjohn-Gibbings (1950). It's designed for a nice nap in the living room, or to serve as an elegant room divider and extra seating. It has an auction estimate of $5,000 - $7,000. The wonderful lipstick red velvet version was designed by Tommi Parzinger (1952). The graceful curve of the back invites you to lounge. The fabulous color would add great pop to the room as well. This has an auction estimate of $10,000 - $15,000. 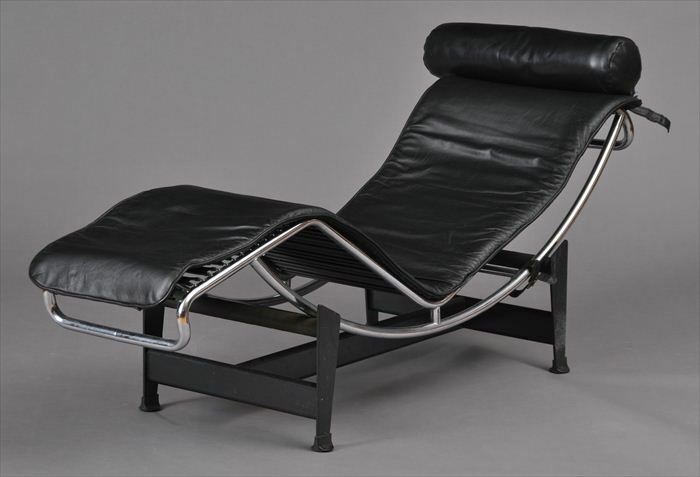 This classic Le Corbusier design was offered in the sale today at Stair Galleries in Hudson, NY. It came with the pony skin cover just like the one in the Elle Decor photo at the top. It sold for $1,200. This gives instant modern design credentials to any decor. For the traditionalist, this Louis XV late 18th century French fruitwood chaise longue is the perfect choice. It has lovely decorative detail and the shape makes it a great style on which to read a good book. This sold last month at the New Orleans auction for $2,952. Even in a busy modern world we need to find time to gather our thoughts and relax. 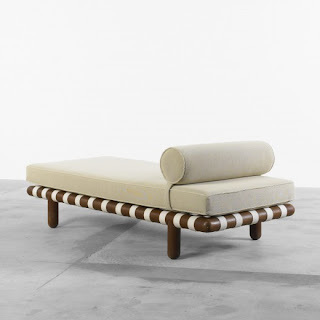 What better and stylish way to do it than lounging on a chaise longue. Loving Italian flair for design!